It's been really cold this week, even a little snow yesterday (no way was it the worst in 10 years, at least, not in London), and I've developed a nasty cold. So as a result, something nice and spicy to clear up the sinuses was required. 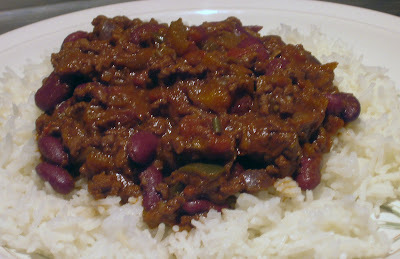 Chili was one of the first things I learnt to cook on an Aga, at the time, utilising a recipe from the "Good Housekeeping" Aga Cookbook (well, the previous edition, anyway). Back then, I didn't tend to mess around much with recipes as I didn't really have the confidence to experiment with slight variations. But, since then, having to cook it in various people's houses with different cooking resources and ingredients available, I have developed my recipe a little more. The most important thing for this one was that it was hot, but not so that it was inedible, but also to include an idea or two from my good friend, Brett's, recipe. I lived with Brett for a few years, and his cooking was always great, so well worth stealing ideas from. Heat the oil in a heavy pan and saute the Onion, Chilli, Celery, Garlic and Pepper until they are nicely softened (10 minutes or so), then add the Beef, and cook until browned all over. Next, add the dried spices, although maybe leave out the Cayenne Pepper so that you can add to taste slightly later on in the cooking process. Mix well, then add the Tomato Puree, Chopped Tomatoes and Worcestershire Sauce and bring to a simmer. Add the Cassia Bark and Bay Leaves, then cover and simmer for another 20-30 minutes. At this point, you should taste it and decide whether you want to add more Cayenne Pepper, Hot Chilli Powder or Cumin. Personally, I find the stock cubes can add enough salt, but add more at this point if there is not enough for you. Simmer for a further 30 minutes, then remove the Cassia Bark and Bay Leaves and add the kidney beans. These days, I try and have 2 tins of Kidney Beans to hand when cooking Chilli, although not everyone likes to have lots of them, but I tend to judge whether the second tin is needed based on what it looks like once I've added the first. At this point, you should stir in the Chocolate until it is melted and mixed in, and then simmer for a further 30 minutes. During cooking, add some of the water if it is drying out too much or if it begins to stick to the bottom on the pan. I always tend to serve the Chilli with Basmati Rice on the day I make it, but I'm usually hoping that there is enough leftovers to have on a Jacket Potato the following day. Thanks for the chilli con carne. Hi mark, I'm a french girl and I will very quickly try your chili con carne which in the really delicious air =D !! Just tried this recipe, came out great. I personally thought that 2 bouillon cubes were a bit too much. But maybe the European ones are bigger than the US ones ... I's actually pretty sure. So I added 2 potatoes that I cut in small cubes to take out a bit of the salt. Other than that, it tastes phantastic!! Thanks for the recipe.